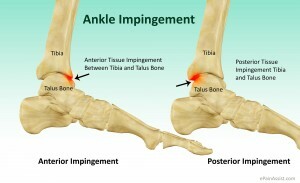 Anterior Ankle Impingement - Book In At Podiatry HQ Clinics Today! During dorsiflexion of the ankle joint, the tibia and talus move towards each other causing compressive forces to occur to the structures at the front of the ankle. When these forces are extreme, it then causes inflammation and damage to the structures in the area, such as the joint capsule and synovial tissue. In some cases a bony prominence known as an osteophyte may form. It is said to form as a protection to the area from repeated pulling of the joint capsule. It does not necessarily have to be associated with arthritis. Diagnositic imaging may be recommended to aid with confirming diagnosis. If these symptoms appear familiar please do come in to meet your friendly podiatrist for further discussion.